There are two things that draw me to the roguelike genre. Firstly, these games are different every time you play. I love procedurally generated games because they generally have a longer life span than their counterparts in other genres. Secondly they’re hard and I don’t like overly-hard games (Dark Souls is not my idea of having a good time) that feel difficult for the sake of it. There is a very fine balance in a well-written roguelike where you know it’s bloody hard but you keep wanting more. This gives you a real sense of achievement as you progress because you know you’re getting better. There is also an element of luck in these games which gives you something else to blame for being atrocious. 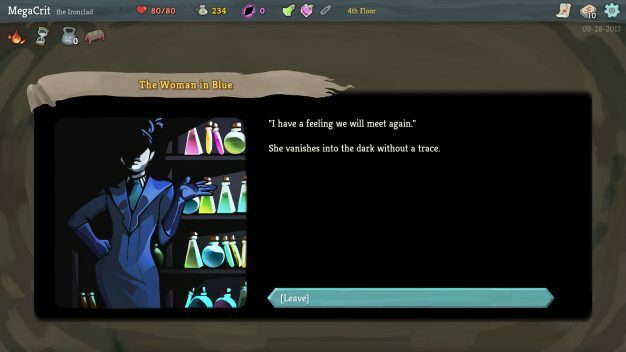 Both of these factors are present in Slay the Spire, a dungeon crawler from developer Mega Crit Games. 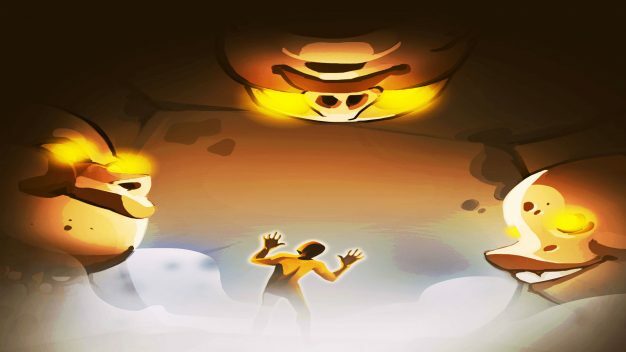 In Slay the Spire, you choose one of three characters (two of which are unlockable) to send into The Spire in the hopes of them not becoming food. The floors are procedurally generated and there’s a varied mix of things wanting to make you expire. We’ve seen this before; in fact it’s the basic chemistry behind a lot of games in this genre. There are a few things, however, that make this title stand out and these are the features that we’ll be looking at in a bit more depth. The first thing to note is that this is a card based game. Everything your character does from attack to defense to their skills come from a deck of cards and each character has their own. The thing I like most about this is that you don’t start with the majority of the cards you’re capable of playing. You have your basic attack and defense cards, one or two abilities and very little else. It’s all just a matter of choice. The more powerful skill cards are picked up by defeating the dungeon’s denizens. This means that you have no idea what mix you’ll get during your game and stops you falling into an over-used play style where you just spam the same skills repeatedly. You have to be smart as you go too. Each time you kill a beasty, you get a choice of three cards and you can only collect one. You have to always be thinking what your deck is doing and how you’re improving it; which is really clever. 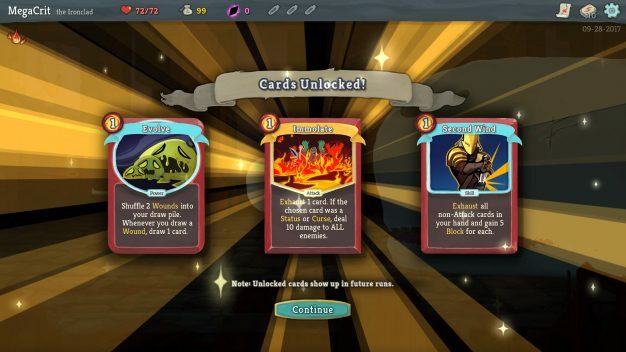 Something else I love in Slay the Spire is the way artifacts (or relics as they’re known) are built. You get these items by defeating bosses and mini-bosses, finding chest rooms or from the store-holder. In a lot of games out there these items are either powerful but really hard to find or they’re good for about five minutes before something better comes along. Either way you’ll be picking up and using everything. In this game you get a choice of three at a time from chests or boss kills. You can pick one item and you have to think what you’re going to want more because many relics are double edged swords. Here is an example of my last run. In a chest I found the following: A frozen core, which gave my Defect a new basic orb; The Soza, which game 1 extra energy each turn but you can no longer use potions; and a busted crown also giving me an extra energy but only letting me pick one card on choice screens. That was an easy pick. It often isn’t. I just mentioned energy. This is what you need to be using to play your cards. Each character starts each turn with three energy points. As I’ve just mentioned there are ways of getting more but you really need to be smart with how you use it. There are some really expensive cards with great benefits but they can be costly and burning all your energy out in one go to play something clever might just get you killed. Slay the Spire is a game of decisions and you are forced to make more with virtually encounter. There is a level of strategy to this that I find really enjoyable. There’s plenty of folk living in The Spire. Thankfully not all of them want you dead. The characters boil down to your basic warrior, rogue, mage classes though this is over-simplifying things a bit unfairly. You start out only being able to take control of The Ironclad he’s your heavy hitting warrior class and is perfectly balanced for learning the ropes. The next character you unlock is The Silent, she’s your rogue class and because she relies on speed her deck has quite a lot of cards which give you the ability to draw. She can also inflict poison on your enemies. I’m not going to insult your intelligence by telling you what it does but suffice it to say it’s bad news in any quantity. Lastly you have The Defect. The Defect is a robot who has the ability to channel orbs. These inflict elemental damage or in the case of Frost bolster your armor. This is my favorite of the three and the one I’ve spent the majority of my time with this game playing. All three classes are brilliant in their own ways they just take a bit of practice getting used to, especially when you’re choosing the cards they’ll be using. There’s plenty of weapons in your arsenal. Coming down to the nuts and bolts this is a really easy title to pick up and play. Everything is mouse controlled so there’s nothing clunky about the UI. The artwork is visually appealing and very well drawn and musically everything fits well for the theme. 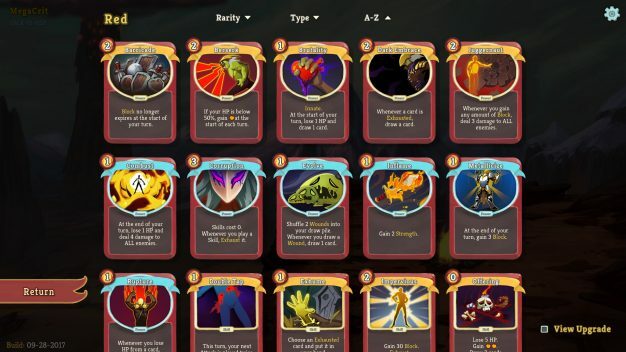 As I say, Slay the Spire already feels very finished and this shows in the aesthetics. I can’t comment on the length of this adventure because it’s so bloody hard that I haven’t made it far into the third floor of The Spire. The game being slightly different every run just adds to the fact that you aren’t going to race through in one sitting and the replayability helps you get the bang for your buck you might be looking for. Not that this game is particularly expensive to begin with. All in all this is a really good, solid little title and one that I think I’ll be playing for a good while yet. I’m really curious to see what the remainder of the Early Access is going to bring and what changes will have been made at launch. 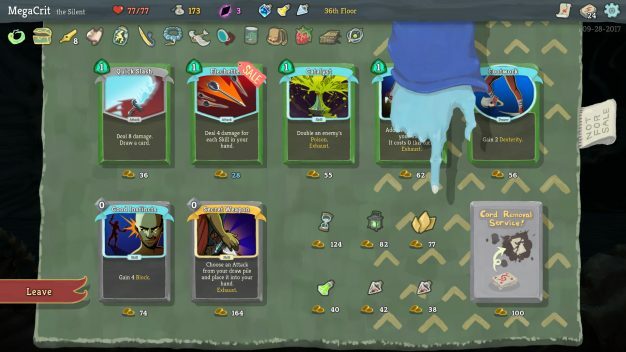 I think buying Slay the Spire now is a smart move. I’m not sure that this game will become more expensive when it’s out fully but if the experience has been added to and it’s been done well I wouldn’t mind putting in a few extra pounds. If you like a good roguelike, this is definitely one worth trying.